For thousands of years, people have used the energy produced by moving water to perform tasks such as grinding grain and sawing wood. 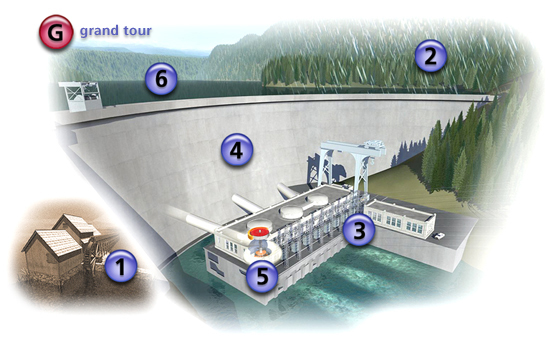 The hydroelectric tour explores the history of hydropower, and also explains how hydropower plants take advantage of a naturally occurring, continuous process that involves the cycling of water through the environment, known as the hydrologic cycle, to convert the potential energy from flowing water into electrical energy. Start your tour by selecting any of the numbered icons to view specific operations and examine each phase at your own pace. Select Grand Tour to view the tour start to finish. For clarification of terms used in the tour, view our Glossary of Terms. Start your tour by selecting any of the numbered icons to view specific operations and examine each phase at your own pace. Or simply select Grand Tour to view the tour start to finish. Enjoy your tour.